For older single people going to the store turns out to be more useful than morning exercise. So say researchers from Taiwan's National Health Research Institute in Dzhunan. Scientists interviewed 1,850 people in Taiwan at the age of 65 years and over living alone. The main question was how often they go to the shops. Then, during the ten years from 1999 to 2008, researchers tracked the status of the respondents in the list of national data on registered deaths. It turned out that people visiting the shop every day, dying less often than those who go shopping less regularly writes CNews . And it is right to maintain, even for those shoppers who have health was poor. 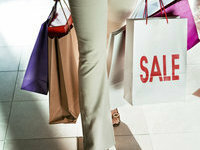 Shopping analyzed the length of time reduces the risk of death by more than one quarter. Older men who often went to the store, lived the longest (reducing the risk of death was 28 per cent). In women the risk was reduced by 23 percent, according to MEDdaily . However, experts recognize that the active consumer behavior may be due to good physical shape, but do not exclude that such activity can have a positive impact on health, reports BBC . "A comparison shopping with other activities such as sports exercises, usually requiring some sort of motivation and sometimes a professional instructor can say that going shopping easier," - the authors of the study.